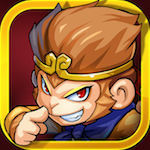 Secret Kingdom Defenders offers solid real-time strategy thrills! Secret Kingdom Defenders is a new entry in the grid-based strategy genre. What helps to differentiate it from other titles in the market is its unique Oriental flavour. The game asks you to control a squad through various self-contained levels, where you must set them up to defeat every enemy that appears on screen. You do this by making sure they're organised into the correct places according to their strengths - close range combat, long-range weaponry, and so on. Battles are in real-time and controlled via swipes and taps on the touch screen. To progress beyond the opening levels improving upon your squad is essential. You can do this by summoning new characters and also improving on the equipment your current members are using. There is also an online element where you can battle others and improve your ranking, with bonus loot available. In-app purchases allow you to buy characters that you can add straight into your squad, but also Jade - which allows you to summon new random warriors to include in your team. 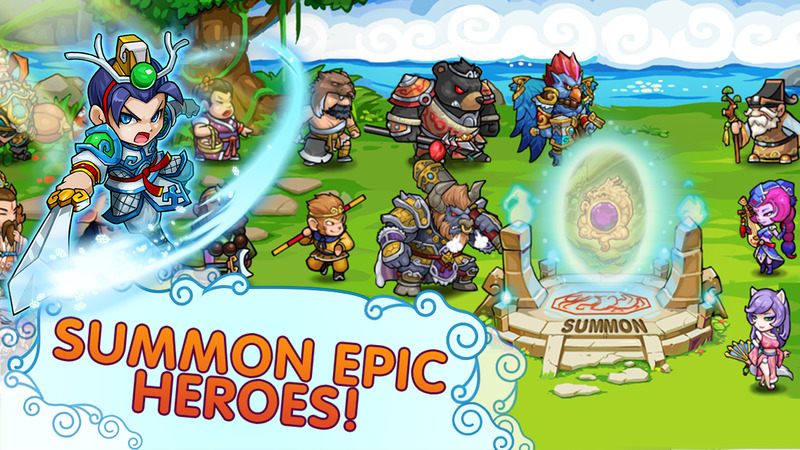 You've played grid-based defence titles such as Battleheart or Hero Academy, right? Well Secret Kingdom Defenders is very similar to those titles, so if you've played them to death then you may want to think long and hard whether you dive into this latest offering from developer Doppler Hat Games. 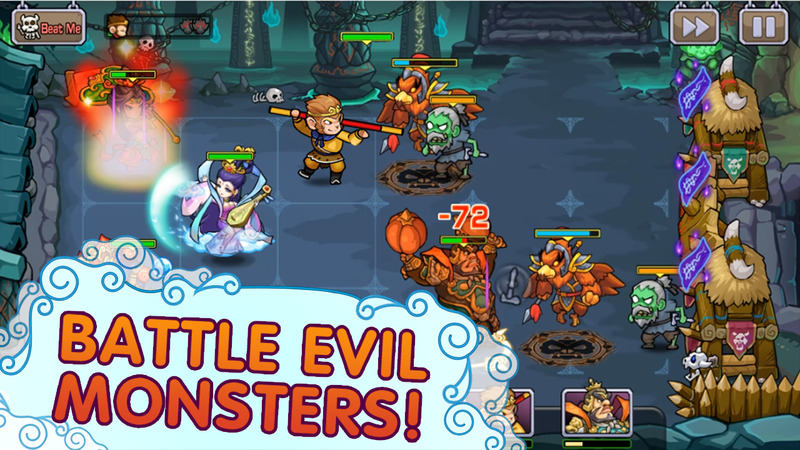 However, if the genre is new to you then you could certainly do a lot worse than check out Secret Kingdom Defenders. It offers solid real-time strategy thrills with an endearing oriental flavour. The plot of the game is fairly simple, as you might expect. Through comic strip panels you are briefly told that a young monk is being kicked from his position of comfort to go forth on a great quest. That's about it. How you approach that quest is where things get interesting. Basically, you progress through a series of self-contained stages by controlling a motley crew of fighters. After they're set up on a 3x3 grid you must then move them into a series of real-time battles that take place across three planes against a variety of enemies. You do this by swiping to move individual warriors, and then locking onto specific foes for them to attack. Where the strategy comes in is when you choose to attack - and which characters you choose to attack with. As you'd expect, different crew members have different abilities, with many better at close combat and others better suited to standing at the back of the arena firing long-range weaponry. Your aim is always the same in battles: destroy every foe that appears. It's game over if every one of your squad is felled, or if a single foe reaches the far left of the screen. With so many elements involved in battles there's always the risk of the combat feeling messy or too random - but it's to the game's credit that you always feel in control. Character react to your commands instantly, and the crisp colourful visuals mean it's always easy to understand exactly what's going on. Battles are good fun too, and wearing down a tough enemy with a well planned squad formation is always hugely pleasing. What isn't pleasing is the way the game asks after around an hour of play for you to either start stumping up cash for in-app purchases or grind away endlessly on previous levels. This is in order to unlock more characters to add to your squad, or equip existing members with superior gear. Although the battle system is undeniably engaging and well designed, it's perhaps not rugged enough to ask you to keep repeating the same skirmishes over and over in order to progress. However, in-app purchases are part and parcel of mobile gaming nowadays, so it's churlish to criticise Secret Kingdom Defenders too harshly. Throw a few dollars the game's way and it's a hugely enjoyable - and impressively presented - grid-based battler.